Home » Geek Adventure » Sitting in an Impala felt so (super)natural! Sitting in an Impala felt so (super)natural! In my last post I talked about going to 2013 Wales Comic Con. What I didn’t mention was my encounter with a very special ‘character’. With some time to kill, we decided to take a walk around the dealers room and around the university itself. As we made our way from one building to another we turned a corner and there, sitting in the middle of the quad, was a Chevrolet Impala! Black, just like the one in Supernatural. I couldn’t believe it! Number 13 on the list was to drive the Impala! I’m not usually into cars (Husband is a petrolhead) but I had fallen in love with this car when I started watching Supernatural. Any Supernatural fan (and they are legion) will tell you that the car is a character in it’s own right. It drives the Winchester brothers from state to state as they battle demons, vampires and wronged spirits. It belonged to their father, John Winchester, and is always filled with the sound of classic rock belting from the speakers. I immediately rush over to it and proceed to take photos and fawn over it. As Husband takes a nosy around it I notice a man sitting on a wall across from the cars watching us. It’s not a creepy watching us; it’s more a ‘scratch that car and I’ll punch your lights out’ kind of stare. I go over to say hello and reassure him that we are fans and not here to dent his baby in any way. I didn’t catch his name as he was a mumbler so let’s call him Dave (cos everyone’s got a friend called Dave) as we get chatting; I ask him what it’s like to drive. ‘Like a dream, but guzzles petrol like a nightmare’ I nod, not because I particularly want a conversation about escalating petrol prices, more because it WOULD be a dream to drive it. A fiver! To sit in the car! I am outraged. Incensed. Disgusted that he would try and take advantage of fans in such a manner. I consider giving him a piece of my mind before stalking off. 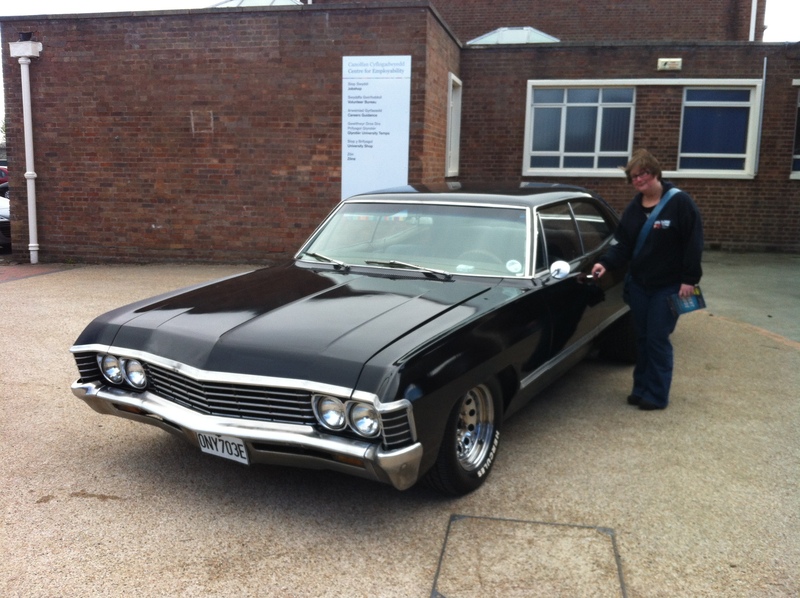 Instead I scramble about in my pocket for five pound coins and race over to Husband yelling ‘Get the camera out, I’m going to sit in the Impala!’ So much for being indignant. Dave opens the driver side and I slide into the leather seats. I’m immediately hit by the smell; it smells of old leather and polish with a faint smell of cigarette smoke. It immediately reminds me of my Dad for some reason. It smells like cars used to smell. I run my hands over the steering wheel and wiggle my bottom in the soft leather seat. Having a ‘Dean’ moment – I can almost hear ‘Carry On My Wayward Son’ playing in the background. There is a crowd starting to gather around the car as other convention goers start to realise that they could get a chance to sit in the car. After a few photos and one last deep inhale of the scent, I reluctantly get out of the car. We sit on the nearby wall and watch as Dave takes in at least another £50 from other excited (mostly female) fans that slide in a pose with their favourite car. The guy is on to a goldmine but just looks a bit confused and annoyed at the whole thing. 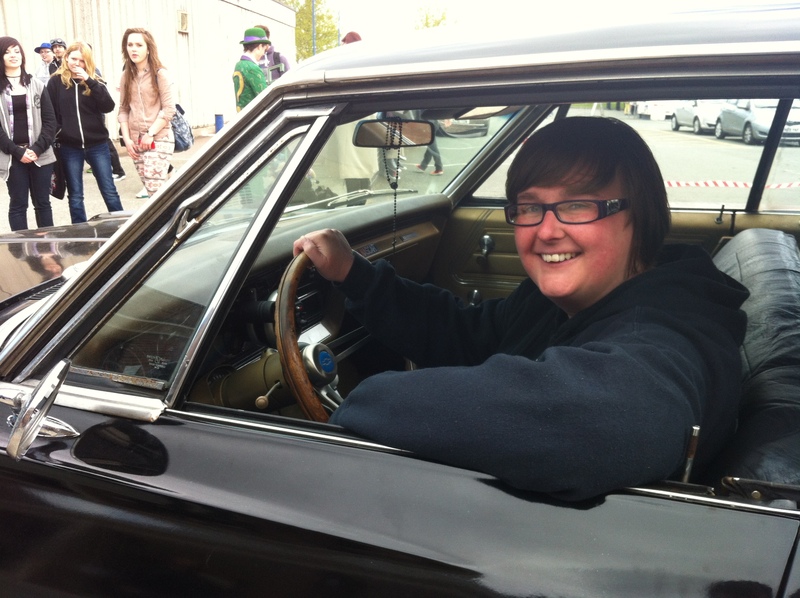 I may not have gotten to drive the Impala but sitting in it was experience enough……for now. This post was of an experience that took place in April 2013.